If you have a cavity or have received tooth damage, what is an effective way to restore the strength of your tooth? Look to Carolina Dental Arts — our dental inlays and onlays in NC look like your mature teeth and are practically as strong! When your inlay or onlay restorations are installed by our leading dentists and receive the proper care, you can expect your inlay or onlay to last as long as 30 years. Offered across Goldsboro and beyond, our restorative dental inlays and onlays cover or replace parts of a damaged tooth by sitting in or on the tooth. They’re a better option for your tooth than a crown or large filling, as they mimic your natural tooth structure. A dental onlay is a great restorative treatment if your tooth has sustained damage, as it is a more affordable NC alternative to crowns and large, old metal fillings. 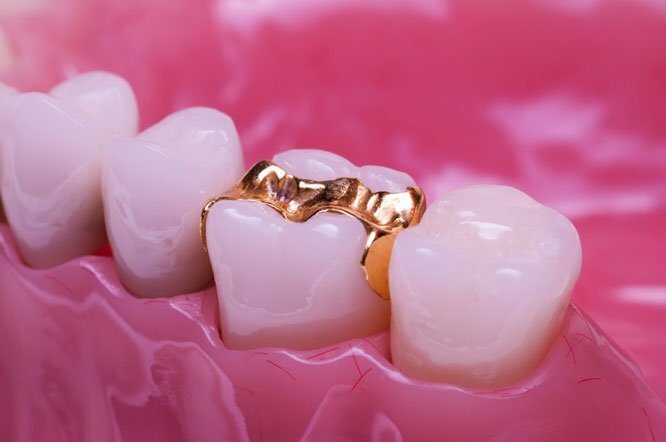 In fact, capping a damaged tooth with a crown can remove tooth structure and create the potential for problems. Dental onlays are durable, cover a portion or the entire biting surface of your tooth, and create less strain on the structure of your existing tooth. Save money and enjoy stronger, more beautiful teeth when you select to receive an inlay or onlay from Carolina Dental Arts. We are a team of professionals that can ensure your procedure will be a positive experience, and we will gladly educate you on the best ways to care for your new tooth restoration in NC. Schedule an appointment by contacting us today!